Title: "Genomics, Proteomics and Metabolomics in Nutraceuticals and Functional Foods". Editor: Debasis Bagchi and Francis C. Lau. Chapter 1. Recent Advances in Nutraceuticals and Functional Foods. Chapter 2. Nutritional Omics: The Molecular Basis between Bioactive Food Components and Human Health. Chapter 3. 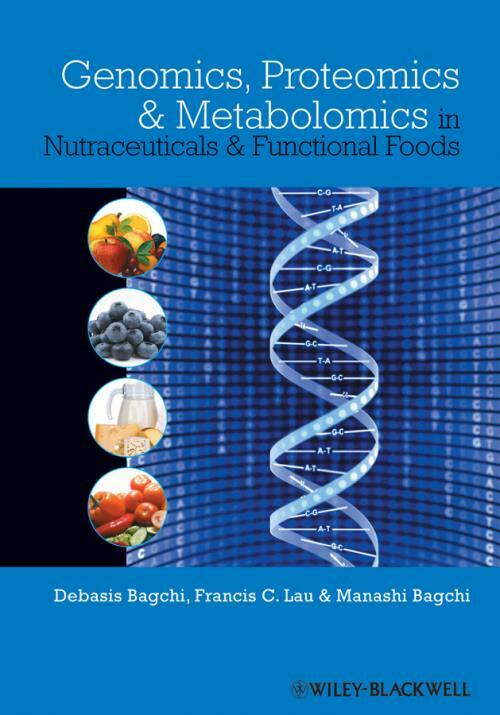 Genomics, Proteomics and Metabolomics in Nutraceuticals and Functional Foods. Chapter 4. An Overview on Genomics and its Future Application in Nutritional Science. Chapter 5. Genomics in Weight Loss Nutraceuticals. Chapter 6. Application of Genomics in the Study of Anti-inflammatory Nutraceuticals. Chapter 7. Genomics Approach to Evaluate Metabolic Syndrome Supplements. Chapter 8. Genomics Analysis of the Beneficial Effects of Dietary Antioxidants. Chapter 9. Application of Genomics in Functional Foods. Chapter 10. Proteomics: Future Application in Nutritherapeutics. Chapter 11. Proteomics Approach to Assess the Potential of Dietary Grape Seed Proanthocyanidins. Chapter 12. Application of Proteomics in Selected Nutraceutical Ingredients. Chapter 13. Proteomics and its Application for Elucidating Insulin Dysregulation in Diabetes. Chapter 14. Metabolomics: A Post-Genomic Tool for Nutraceuticals and Functional Foods. Chapter 15. Role of Metabolomics in Understanding Lipid Dysfunction in Obesity and Diabetes. Chapter 16. Evaluation of the Beneficial Effects of Antioxidants in Functional Foods by Metabolomics. Chapter 17. Application of Omics in Personalized Nutrition. Chapter 18. Omics and its Application in Personalized Phytomedicine. Chapter 19. Commentary: Contribution of Omics Revolution to Human Nutrition Research. Debasis Bagchi, Ph.D., Adjunct Professor of Medicinal Chemistry, Pharmacological and Pharmaceutical Sciences Department, University of Houston, TX. Francis Lau, InterHealth USA, Benecia, CA. Manashi Bagchi, Ph.D., InterHealth USA, Benecia, CA.